As a keen angler brought up in an area where at one time game fish were very abundant, it’s a constant topic among other older anglers about the lack of fish nowadays and taking fish home to eat versus conservation. Brown Trout are a resilient species who’s main predator is man. 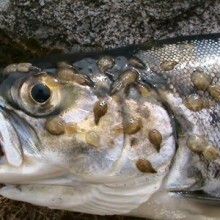 Certainly abundance varies, but unless they are in a nutrient poor loch and river system where they are forced to migrate to sea making the physiological adaptions to live there (some don’t) for better feeding, they are a more sustainable catch by and large than salmon and sea trout with less threats and predation along a migration route which for salmon can be 3,000 miles. Migrated Brown trout or “Sea Trout” where they become a coastal fish feeding in the sea and open to more predation from seals, cormorants and even sea otters. 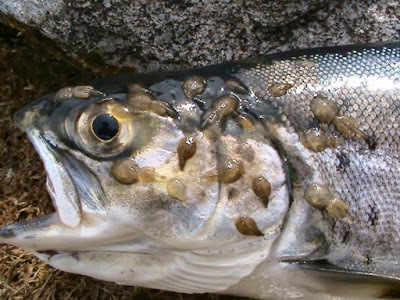 Uncontrolled blooms of the natural parasite “sea lice” coming from fish farms almost obliterated Sea Trout on the Scottish West coast as the blooms occurred in the sheltered inland lochs and the sea trout couldn’t escape. Stocks are still very poor in comparison with 30 years ago. I am not against modern salmon farming as in some ways they have taken the pressure off the Atlantic Salmon from poaching. Also its become a criminal offence to sell or buy wild salmon even if its just a part of one (hotels and restaurants beware, as fisheries bailiffs have the right to enter and check your premises). Fish farm lice controls are now much better and more natural by using Wrasse a little fish that eats the lice off the salmon in the cages. In the past attempts to control the lice was with “SLICE” a pesticide, pretty horrible stuff to the environment. Because juvenile salmon have to migrate through these sea lochs and the blooms they were killed by lice infestations and the west coast salmon stocks collapsed through the 1990’s onwards. In fact in some rivers the native salmon are now extinct or on the brink. Initiatives like that by Lochaber Fisheries Trust with the river Strontian Anglers are trying to bring them back by a conservation and a restocking programme. You can only stock with native fish as it just doesn’t work importing fish from one river to another, and research has shown that each river no matter how small has its own genetic stock different from one even a mile away. This year for the first time there is a glimmer of hope and signs that early spring fish have been coming back. 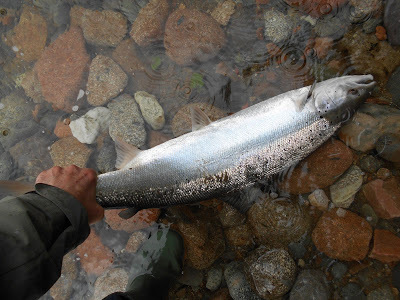 These bigger mainly hen fish carry many more eggs than the Grilse who more often are male and the smaller late summer salmon, and these “springer’s are rarely killed especially by knowledgeable anglers, as they are the fish equivalent of the White Rhino. Don’t get me wrong taking home a salmon to feed youre family from a sustainable stock is ok, but most anglers these days whether trout or salmon only take what they need for a meal. Who needs to kill more than that? Farm Salmon is so cheap and of such a quality in the shops that its much more affordable, so if friends other than immediate family like salmon they can get it there and help conserve the rare wild Atlantic salmon and sea trout. Anglers should enjoy their fishing but know that they are also conservationists. A recent chat with a local angler reminded me that there is still work to do getting that message across as the fisher moaned about not being allowed to fish with a worm and releasing fish. I pointed out that they were not anglers in the true sense then, as none I know have a problem as they care as much about the fish as they do the fishing. 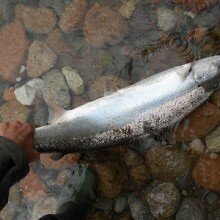 A spring fish of about 15lbs held briefly in the water and realeased full of energy. The job of angling and conserving.